Here are the two Pilot Pocket Brush Pens that this review will cover today. A disclaimer must be made first. These Pilot brush pens aren't technically brush pens in the sense the tips have no bristles. However, they are capable of creating thick and thin strokes just like bristle brush pens. 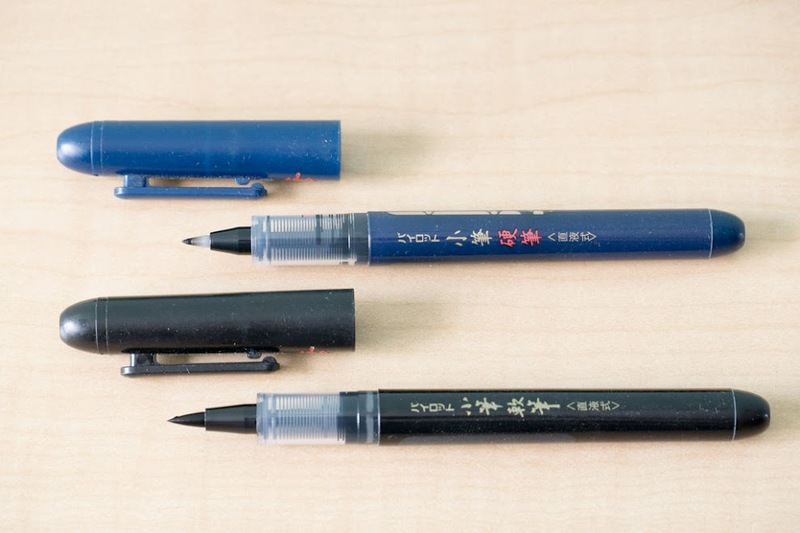 The Pilot Pocket Brush Pens come in two tip sizes, soft and hard. The black body has the soft tip while the dark blue body has the hard tip. 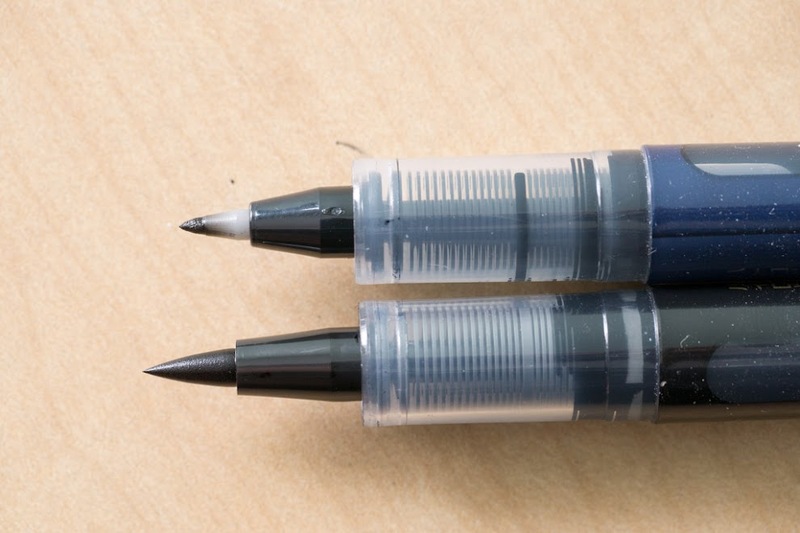 Part of the pen's body is transparent so you get to see the ink level inside. 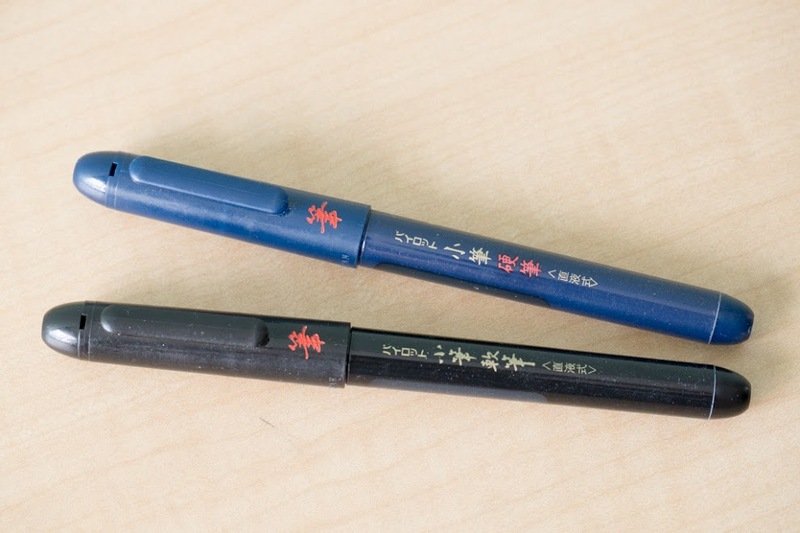 The soft tip is actually a brush-shaped sponge-like tip that's soaked with ink. The tip is about 7mm long and can produce a maximum 2mm stroke. Since it's not an actual brush, the stroke is not able to spread as wide compared to say, the Pentel Pocket Brush Pen (1.2cm tip creates a 4.5mm stroke). The hard tip is actually more like a felt tip marker. It can produce a 1mm stroke. Both brush pens are capable of producing very thin strokes and when you apply pressure you will get thicker lines. In the above comparison, from top to bottom, there's the hard and soft tip followed by the Pentel Pocket Brush Pen. Note the thickness of the strokes and how dark the inks are. The liquid ink is dark black but it's not waterproof. It also takes quite a while to dry. Be careful not to smudge your drawings with your hand, something that happens to me often. The sponge type brush tip is definitely less flexible than a bristle brush. However, it's still sensitive enough to pressure to produce varying stroke thickness. The soft tip has greater variation because it can go thicker than the hard tip. If I can only buy one pen, I'll get the soft tip. Ink flow is fantastic. Not matter how fast you draw, there's no skipping. The pens are not capable of any dry brush effect. If you draw fast with the soft tip, it produces a sound that's similar to that you get when you run a wet sponge over glass. Not a sound I like, but I don't draw that fast often to hear that. 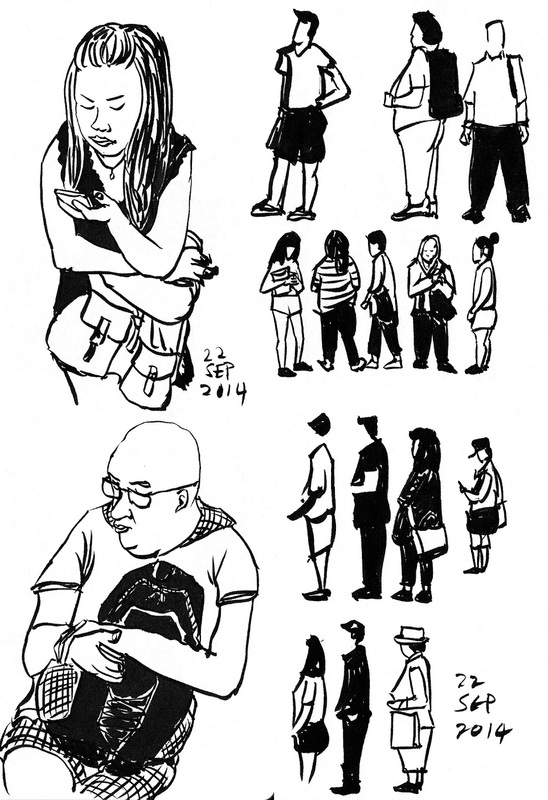 Below are some sketches I drew with the pens. 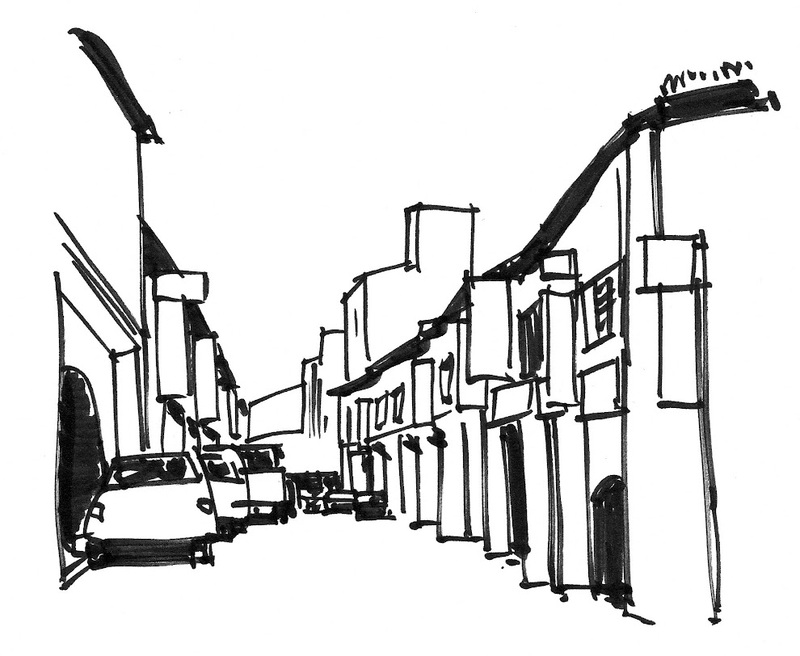 These are quick sketches drawn with the soft tip. The thicker tip is good at blocking in the black areas. For larger black areas, I prefer using a dip brush (at home) to conserve the ink inside the brush pens. 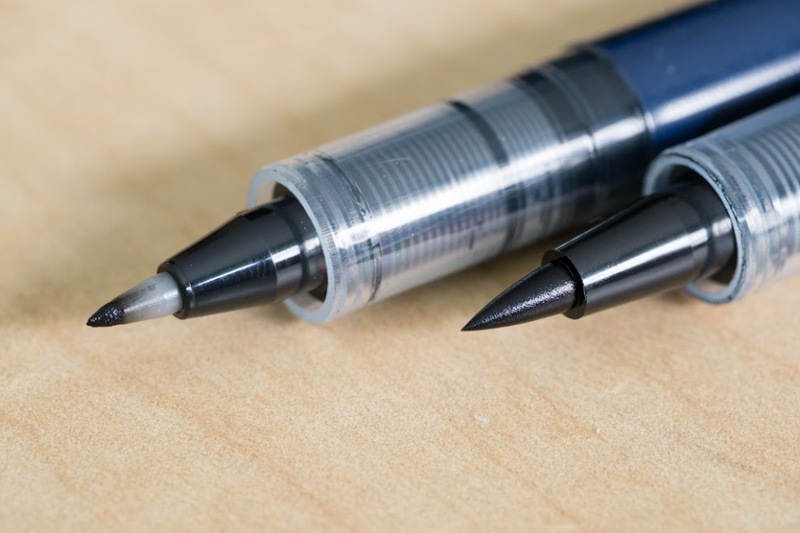 Ink gets used up quite quickly with the soft tip because the stroke uses more ink. Unfortunately, the brush pen is not refillable so I'll recommend getting a few in case the ink runs out. The feed system looks like the Pilot V7 Tecpoints that I have, so I tried to pull out the front part with pliers. Well, the small black plastic part behind the tip came off instead of the getting the whole feed out. It reveals a thin felt stick that supplies the ink to the sponge. So I guess there's no easy way to refill this pen which is such a shame because the sponge tip looks durable. This was drawn with the soft tip and the blacks are filled with a dip brush. You might be able to see two shades of black. The darker shade is from the brush pen, and the other shade from the dip brush. This was drawn with the hard tip. I tend to draw with more pressure so the strokes above are uniformly thick. To get a thin stroke with the hard tip brush pen, just hold the pen but let the tip fall onto the paper instead of pressing it against the paper. This was drawn with both the hard and soft tips. I used the hard tip or the lines and the soft one for filling in the blacks. More economical in the long term because there are refillable cartridges. There are quite a few major differences, but it's good to have choices. 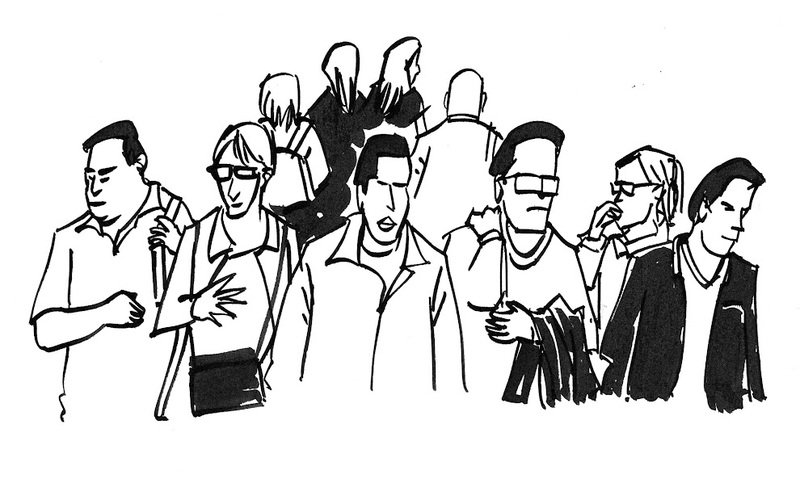 If you're just drawing black and white, the lack of waterproof ink in the Pilot Brush Pen will not matter much. Another thing to note is when you're using the brush pen or brush on their sides. The tip of the soft sponge tip will not touch the paper. This will affect how you fill your black areas as the tip is not reaching the place where you expect it to be. As for the bristle brush, the tip will be in contact with the paper and great for filling in black areas. While not technically a true brush pen, the Pilot Pocket Brush Pen is still a very capable pen that can give you varying thickness to your lines. The soft tip is more versatile than the hard tip so I would recommend skipping the latter. 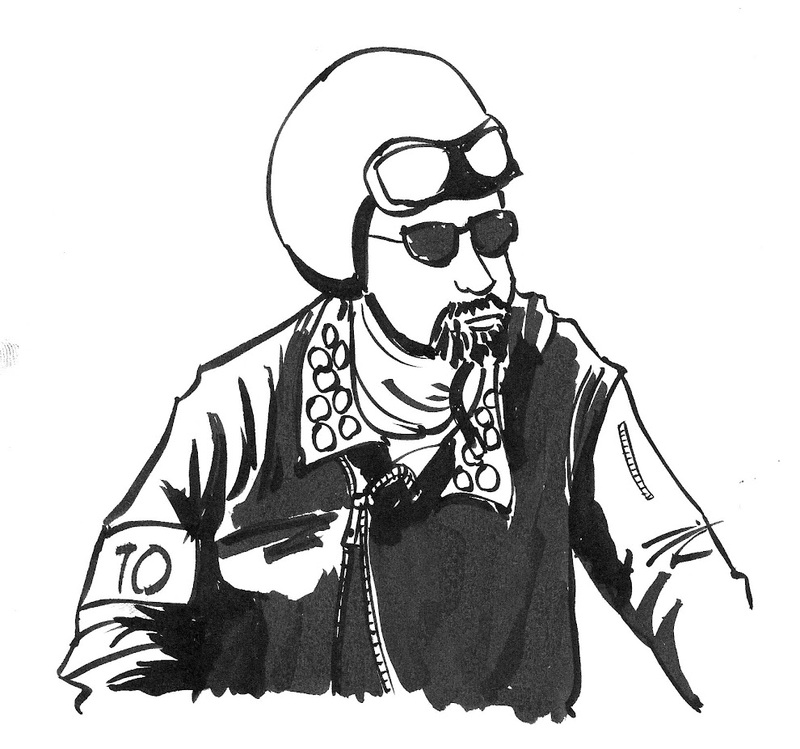 One of the key advantage of the Pilot brush pen is the fantastic ink flow. Often, I would get the dry brush effect with the Pentel brush pen because for some reason, I think the ink is too thick to flow fast enough. The Pilot brush pen is great for quick sketches and doodles.